Photo by Stephanie Joyce, KUCB – Unalaska. 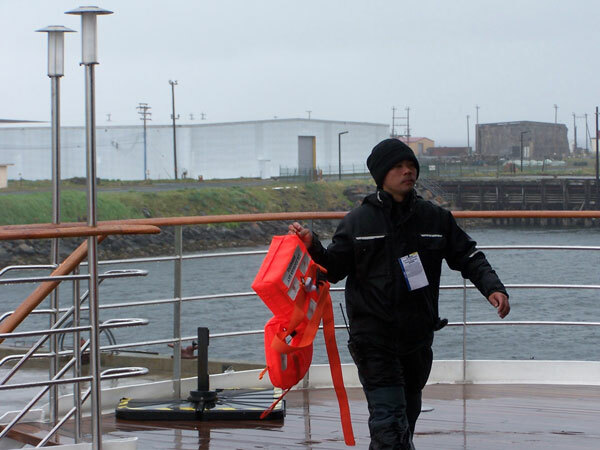 It’s not often that cruise ships call in the far western Aleutian port of Adak, but earlier this month, one did just that. The 295-foot Caledonian Sky wound up in Adak after bad weather forced it to bypass its original destination. The unexpected visit temporarily doubled the population of the remote community – and turned some Adak residents into tourists in their own town. 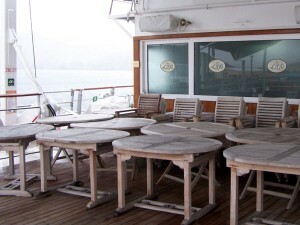 In Adak, the arrival of a cruise ship is a big deal. Most people satisfied their curiosity just by driving past, but ten residents – a tenth of Adak’s population – actually got a tour of the Caledonian Sky. 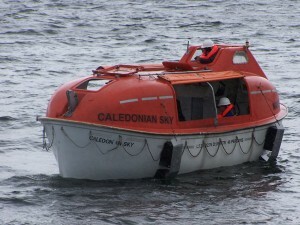 The Caledonian Sky is small – fewer than 100 passengers – and it doesn’t take long to see the ship. We visit the forward lounge and the aft lounge, peek into a stateroom with huge glass sliding doors and its own balcony, and admire the elaborate place-settings in the dining room. The adults are impressed, but 7-year-old Adrian Diaz is more interested in a different part of the ship. 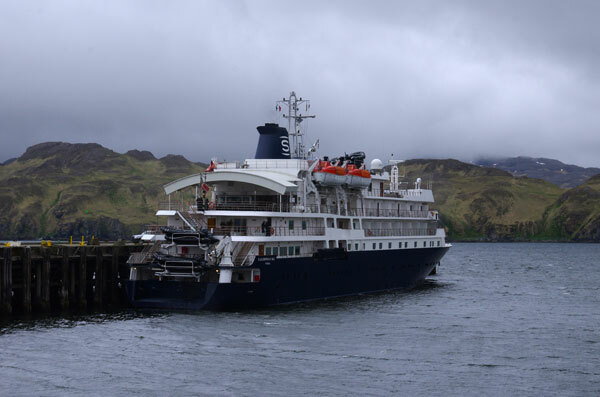 The Caledonian Sky is what’s known as an expedition cruise ship – It specializes in off-the-beaten path voyages, and bills itself as ideal for “seafaring explorers.” Despite the sideways rain, many passengers were draped over the rails as the ship pulled into Adak, peering at shore through binoculars and camera lenses. Some even disembarked for soggy, self-guided tours of town. Marine pilot John Schibel rode with the ship from Kamchatka to Adak, and he says that wasn’t the least bit surprising. After the tour, we head to the lounge. The passengers have lots of questions about life at the end of the Chain, and it quickly becomes clear that as extreme as they may be, they think people who live in Adak are much more extreme. Cynthia Galaktionoff was one of the first people to move to Adak after the Navy cleared out, and she enthusiastically plays the role of ambassador for the struggling community. In her opinion, Adak just needs to be approached with the right attitude. “I talk to everyone, and one day I’m going to meet a kabillionaire, who’s going to say, ‘yeah, we’ll start a whole new business out there.’ Because everyone who comes here loves it. They do. I mean, some people have bad experiences, but not if they meet me,” Galaktionoff said. It turns out all of the passengers get to meet her when she’s invited to give a talk about Adak, and its history. Galaktionoff starts with the thousands of years of Unangan habitation, and then Vitus Bering’s arrival, the build-up of tens of thousands of troops during World War II, and the Cold War era, when Adak was a naval base. But afterwards, the passengers mostly have questions about what it’s like to live in Adak now. Passenger: Do you have any police and fire people here? Alas There aren’t any takers. Visiting Adak is one thing, but living there is truly an adventure. © Alaska Public Media 2016. All rights reserved.